Soba is an authentic Japanese buckwheat noodle, sometimes also made with half wheat flour, half buckwheat. It has a stronger flavor than plain noodles and is slightly thinner than a spaghetti noodle, making it perfect for stir-fry. 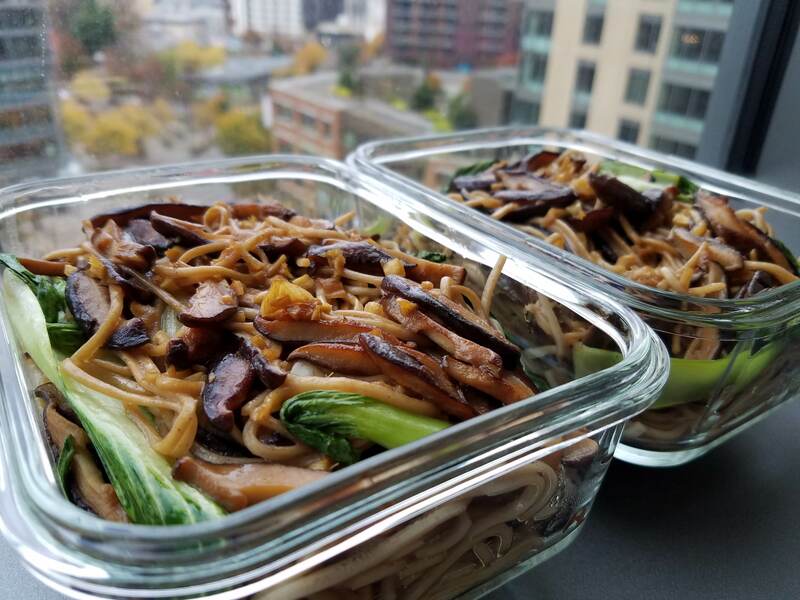 I love yakisoba, and Japanese food in general, but sometimes yakisoba (at least from many places in America), tend to be over-sauced causing the vegetables to go limp and the noodles to swell more than they should. 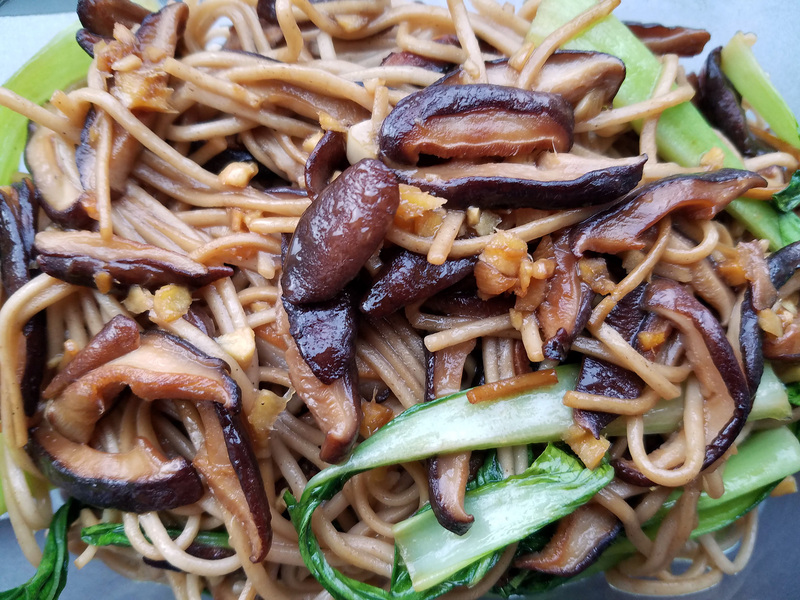 This vegan shiitake mushroom and bok choy soba has a rich flavorful sauce that coats the noodles and vegetables well without being "too saucey". The shiitake mushrooms have a nice meaty texture and the crisp bok choy gives a nice crunch along with some fresh wilted greens to round it out. It is simple, yet elegant. You can also meal prep the hell out of this dish. It tastes just as good on day two and three - if it lasts that long without you eating it! And if you are like me, anything you can meal prep is a plus. It reheats very well with a short trip to the oven in about 30 minutes, making busy weeknight dinners a breeze. To reheat, place meal-prepped single servings (30 oz. containers about 3/4 full) in a preheated 350 degree Fahrenheit oven, covered with foil. Bake 20 minutes, remove foil and stir. Continue baking uncovered, another 5 - 10 minutes or until hot. Where can I buy Soba? You can buy Soba noodles from most grocery stores in the international food section. My favorite is Hakybaku Organic Japanese Soba Noodles with no salt added. You can buy them in most Whole Foods or on Amazon. These come in three bundles per pack which is about 3 ounces per bundle (1 bundle serves 1). If you are unable to find Soba noodles, you can substitute for whole wheat spaghetti in a pinch. You could also use fresh Soba noodles if you have access to a quality Asian foods market. Serves 2. If meal-prepping this recipe, double it. All my ingredients are Organic. Bring a large pot of unsalted water to a boil. Cook noodles per package instructions, drain (reserve about 1 cup of cooking liquid) and rinse with cool water till cool to the touch. Set aside. While water is coming to a boil, prepare your mushrooms. Clean the mushroom caps with a damp cloth to remove excess dirt and discard woody stems. Do not wash your mushrooms under water as they will absorb a lot of the water and your mushrooms will not brown up when cooking. Washing and/or under cooking is typically the cause of "soggy" or "slimy" mushrooms). Thinly slice caps into 1/8" slices. Set aside prepared mushrooms. To prepare your bok choy, rinse well under water to remove dirt and sand. Dry with a towel to remove excess liquid. Cut off the bottom 1/4" of the bok choy from the base, discard this tiny bit. If you are using larger bok choy, slice in half lengthwise. If using baby bok choy, keep whole. Set aside prepared bok choy. When your noodles are done, in a large non stick sauté pan heat butter with 4 tablespoons low-sodium soy sauce and add mushrooms over medium-high heat. Give a quick stir to coat and then cook for 4-6 minutes or until starting to brown. Give them another stir and cook an additional two minutes. They should be brown, somewhat crisp and a beginning to caramelize. Meanwhile,for the sauce, combine mirin, garlic, ginger, sesame oil and 1 tablespoon of soy sauce in a small bowl. Add sauce, bok choy and noodles. Cook over medium-high heat till the bok choy is wilted, about 1 - 2 minutes. Top with sesame seeds and serve immediately or fill 30 ounce glass meal prep containers about 3/4 full and store in refrigerator, lasts up to 3 days.